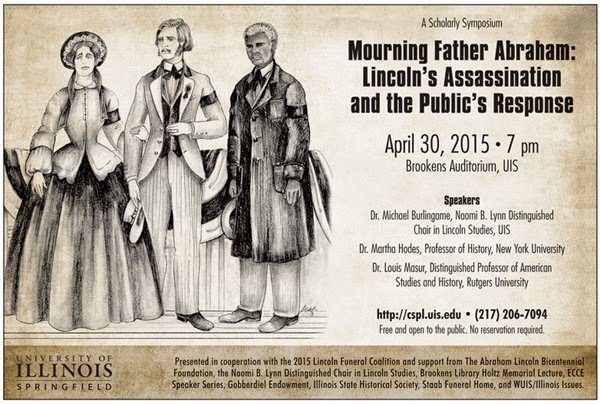 The University of Illinois Springfield will present a scholarly symposium on Thursday, April 30, 2015 as part of the Lincoln Funeral Coalition’s commemoration of the 150th anniversary of the funeral of Abraham Lincoln. The event will be held from 7 to 9 p.m. in Brookens Auditorium, located on the lower level of Brookens Library at UIS. It is free and open to the public. No reservation is required. The symposium, “Mourning Father Abraham: Lincoln’s Assassination and the Public’s Response,” will feature three prize-winning historians of Lincoln and the Civil War era. Featured speakers are Louis P. Masur, distinguished professor of American Studies and History at Rutgers University, Martha Hodes, professor of History at New York University, and Michael Burlingame, Chancellor Naomi B. Lynn Distinguished Chair in Lincoln Studies at UIS, who will give opening remarks on “Lincoln as Father Figure,” and serve as moderator. Masur’s presentation, “Lincoln’s Last Speech and the Problem of Reconstruction” will focus on the path to Reconstruction Lincoln outlined in his final speech, including his call for black suffrage. In her presentation, “Shock and Fury, Gloom and Glee: Personal Responses to Lincoln’s Assassination,” Hodes will describe the range of responses to Lincoln’s death, gleaned from diaries and letters, reflecting a moment of national uncertainty and competing visions of the country’s future. Both guest speakers will draw on their new books. Masur is the author of Lincoln’s Last Speech (Oxford University Press, 2015). Hodes is the author of Mourning Lincoln (Yale University Press, 2015). Burlingame is the author of the two-volume biography, Abraham Lincoln: A Life (Johns Hopkins University Press, 2008). A reception and book signing will immediately follow the event. The symposium is sponsored by the Center for State Policy and Leadership and the Chancellor Naomi B. Lynn Distinguished Chair in Lincoln Studies at UIS, and is presented in collaboration with the 2015 Lincoln Funeral Coalition and with the support of The Abraham Lincoln Bicentennial Foundation. Event cosponsors include the Brookens Library John Holtz Memorial Lecture, Engaged Citizenship (ECCE) Speaker Series, Gobberdiel Endowment, Illinois State Historical Society, Staab Funeral Home, and WUIS/Illinois Issues. Doors will open at 6 p.m. Seating in Brookens Auditorium is limited; however overflow seating will be available in the Public Affairs Center, Level 1, Conference Rooms C/D, G and H where the audience can watch a large-screen live video feed. Those unable to attend in person can watch a live webcast by going to www.uis.edu/technology/uislive.html at the time of the event. For more information, contact the Center for State Policy and Leadership at 217/206-7094 or visit http://cspl.uis.edu.